South Africa got their World Cup back on track after the opening game humiliation to Japan by thrashing Samoa, but the battering of Scotland 34-16 at St James’ Park in Newcastle has sent them top of Pool B in what was a must win game. Tries from 2007 World Cup-winners Schalk Burger, JP Pietersen and Bryan Habana and 19 points from a majestic Handre Pollard was only made possible by one of the most dominant forward displays in the tournament’s history. Scotland scored through wing Tommy Seymour. 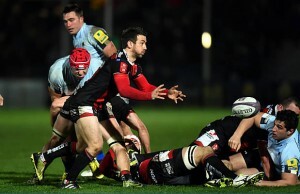 Captain Greig Laidlaw kicked a conversion and two penalties, but was sin-binned at a crucial time in the match. The Springbok forwards might have been back to their best against Samoa last weekend, but at the home of the Magpies, they were brutal as they dismantled Scotland’s helpless pack. Through Lood de Jager and Eben Etzebeth in the boiler room, Burger, Francois Louw and Duane Vermeulen in the back-row to Beast Mtawarira and the Du Plessis brothers, Jannie and Bismarck, the Boks set the foundation for this impressive win. The pack mauled Scotland around the park, attacking their line-out and scrum set piece – something no team has done under Vern Cotter and not with the Scots’ pair of brothers, Richie and Jonny Gray. Under the command of the the ‘General’ Fourie du Preez, Heyneke Meyer’s team flourished. Laidlaw had no answer to his opposite number and how he wished he could of been in white. The Boks started with a point to prove, within the opening ten minutes, Scotland had lost two line-outs, a scrum and were turned over at the ruck by Louw, giving away a penalty. 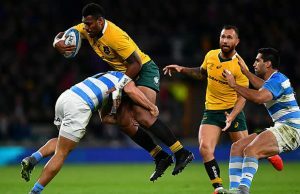 The Springbok forwards took control of the Test from the first whistle and in the lead up to their opening try, although the returning Blair Cowan did his best to disrupt the breakdown – where the Boks flourished. The Boks went through 16 phases before Burger was awarded a TMO-referred try after crashing over from close range. Handre Pollard slotted a simple conversion for a 7-0 lead after 13 minutes. The 21 year-old flyhalf kicked an easy penalty in front of the posts four minutes later after referee Nigel Owens penalised the Scots for collapsing a 30 metre driving maul. Both teams were using box-kicks to gain a territorial advantage in the first quarter. Stuart Hogg by now was running with conviction and his kicking out of hand was excellent, but ceding possession. sent Jannie du Plessis to the sin-bin for not using his arms in a the tackle. The Boks’ tight-five made 43m carrying the ball to Scotland’s 16m, continuing the South African pack’s dominance in the first half. Even with 14 men the Springbok pack never wavered and set up another driving maul. From the drive a ruck was formed and Du Preez sent Pietersen into a gap to score on the stroke of half-time. Pollard added the extras and South Africa led 20-3 at the break. Cotter must have given his team the hairdryer during the break because they came out with conviction at the start of the second half and took the game to the Boks. South Africa went through the phases in the Scots’ 22m but without penetrating. Then a moment of opportunism from Duncan Weir set up Seymour’s try after an intercept and 50 metre run. Tim Visser was in support when Pietersen caught the standoff and then popped the ball infield for the wing to score. Laidlaw added the two points and out of nowhere, Scotland had the momentum and were only a converted try behind at 20-13. Scotland’s handling however was poor and the errors were punished by Pollard, who kicked a drop goal almost immediately after Seymour’s score. The following 20 minutes became an arm wrestle and the Scotland skipper did not do his team any favours when he was yellow-carded for a cynical tackle on Bryan Habana who did not have the ball. Laidlaw being the captain and goal kicker meant that his 10 minutes off the field was a double blow. Going into the last quarter the Boks were penalised, but Weir made no mistake, cutting the deficit to seven points for the second time in the match. The feeling among Cotter and the TV pundits was that if the Scots could be in the game in the final 20 minutes, then they could perhaps beat a tiring Bok team under pressure. David Denton was penalised just inside his half and Pollard kicked a massive penalty to extend his side’s lead to ten. The substitutes started to come on and fitness as well as the enormity of the Test for quarter-final spots would decide the outcome – the next team to score, you felt would go on to win. Du Preez controlled the tempo in the final 15 minutes. Marshalling his troops with a calm head has been a virtue of the scrumhalf throughout his career and is a master of closing games out. Pollard extended the lead to 13 points after Owens penalised Scotland at the ruck, 29-16. 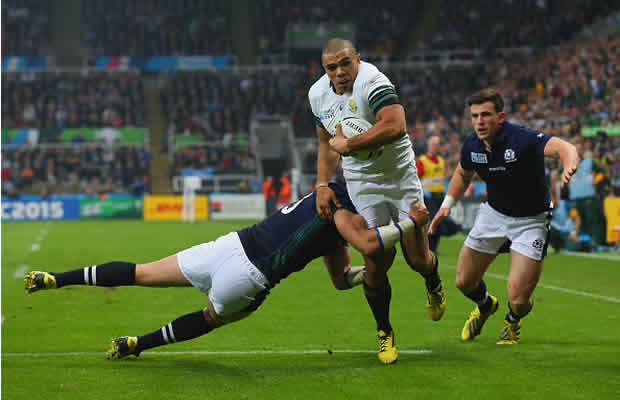 Etzebeth and Man-of-the-Match De Jager kept bashing away at the Scots. Eventually, Habana scored after Adriaan Strauss broke through beleaguered Scottish defence, Du Preez collected and again sent one of his wings over; the conversion was missed, but the game, over. 15 Stuart Hogg, 14 Tommy Seymour, 13 Richie Vernon, 12 Matt Scott, 11 Tim Visser, 10 Duncan Weir, 9 Greig Laidlaw (captain), 8 David Denton, 7 Blair Cowan, 6 Josh Strauss, 5 Jonny Gray, 4 Richie Gray, 3 Willem Nel, 2 Fraser Brown, 1 Gordon Reid. Replacements: 16 Ross Ford, 17 Alasdair Dickinson, 18 Jon Welsh, 19 Tim Swinson, 20 Ryan Wilson, 21 Sam Hidalgo-Clyne, 22 Peter Horne, 23 Sean Lamont. 15 Willie le Roux, 14 JP Pietersen, 13 Jesse Kriel, 12 Damian De Allende, 11 Bryan Habana, 10 Handré Pollard, 9 Fourie du Preez (captain), 8 Duane Vermeulen, 7 Schalk Burger, 6 Francois Louw, 5 Lood de Jager, 4 Eben Etzebeth, 3 Jannie du Plessis, 2 Bismarck du Plessis, 1 Tendai Mtawarira. Replacements: 16 Adriaan Strauss, 17 Trevor Nyakane, 18 Frans Malherbe, 19 Pieter-Steph du Toit, 20 Willem Alberts, 21 Ruan Pienaar, 22 Pat Lambie, 23 Jan Serfontein.